What is an ‘About Me’ Bullet Journal Layout? As bullet journaling grows in popularity, people are craving even more unique and inventive spreads to try out. Among the many different types of fun layouts to try, one of the newest ones showing in the community is the About Me bullet journal layout. It’s a layout that is all about YOU in the very moment of time you create it. It’s your place to take a notebook screenshot of your life; what you like, what you’re passionate about, what you want to remember when you come back and look at this five years in the future. What’s beautiful about the About Me pages is that beyond having a place to document yourself, there is no right or wrong way to complete this task. About Me bullet journal layouts can highlight any topic of importance to you. They can be funny, or maybe serious if you prefer that tone. You choose if you want the layout to take one page or two. You can make them into organized lists, or have the entries be random and scattered. 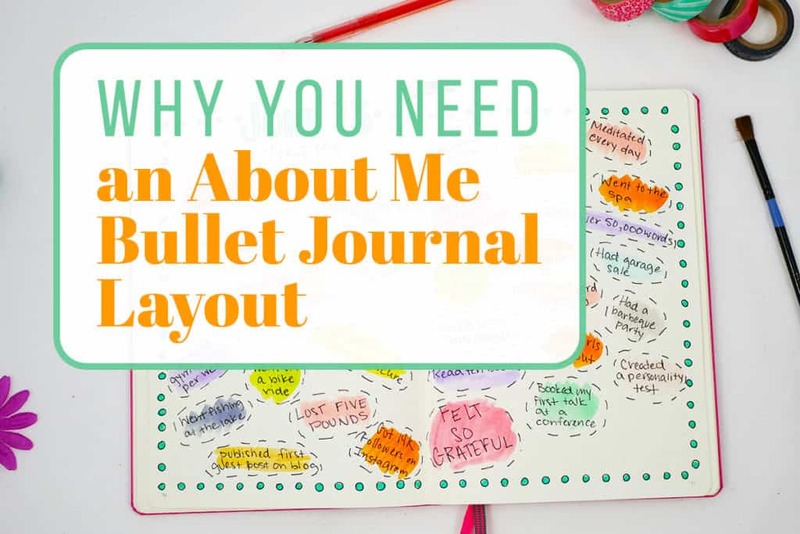 Here are different types of information that you can choose to include in your About Me bullet journal layout. Screenshot of your current life: your job, your relationships, your activities, hobbies, what you’re doing or even activities you’ve done recently. Things you enjoy: favorite quotes, favorite television shows or books, your favorite doodles, stickers. Information about yourself: your age, your accomplishments, random information that you think is cool (for instance, I was born on Friday the 13th… I actually included that in my very first about me!). A mix of all three: there is no rule saying you have to do each element separately; if you prefer, you can include all of them. One of my favorite things about the About Me page is there is no one way to do it. They are as unique and individual as each different kind of bullet journal. Do you need to fill in all of the about me section in one swing? Absolutely, if you’d like! Do they need to be a certain number of pages? 1-2 pages dedicated to this layout is common, but you could do more if you prefer. Another option is to leave space in your About Me bullet journal layout (especially if you’re doing one for each bullet journal). 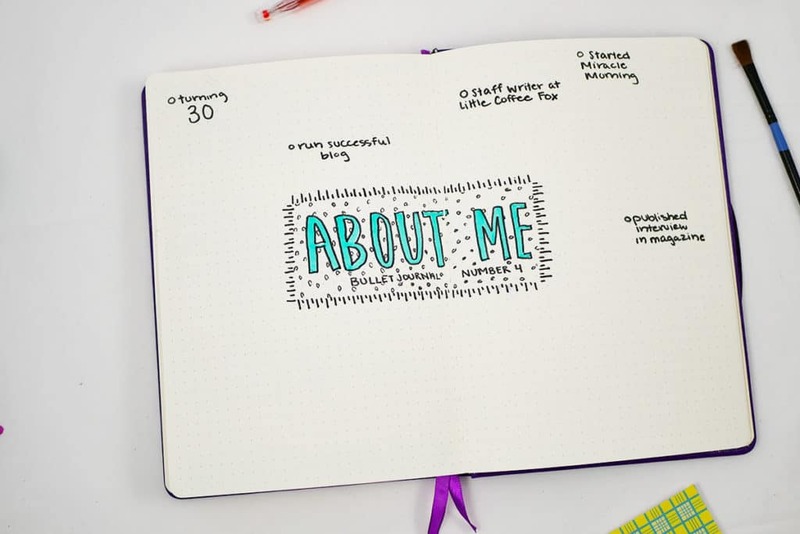 As you work through your bullet journal and new/interesting things come up in your life, you can add that into your About Me section as you go. Even if you don’t believe you have interesting things come up during the duration of your bullet journal, I guarantee you will always remember things you’d like to add at a later time. So if you keep space open, it’s so much easier to just go in and add the things that you forget as you go along. Beyond what you put in the About Me pages in your bullet journal, the frequency of when to create one is entirely up to you as well. You can choose to do one once per year. Maybe you’d like to incorporate them into each bullet journal. Some people do them every single month! Or if you just get a stream of inspiration, you can just do it whenever you feel like it. 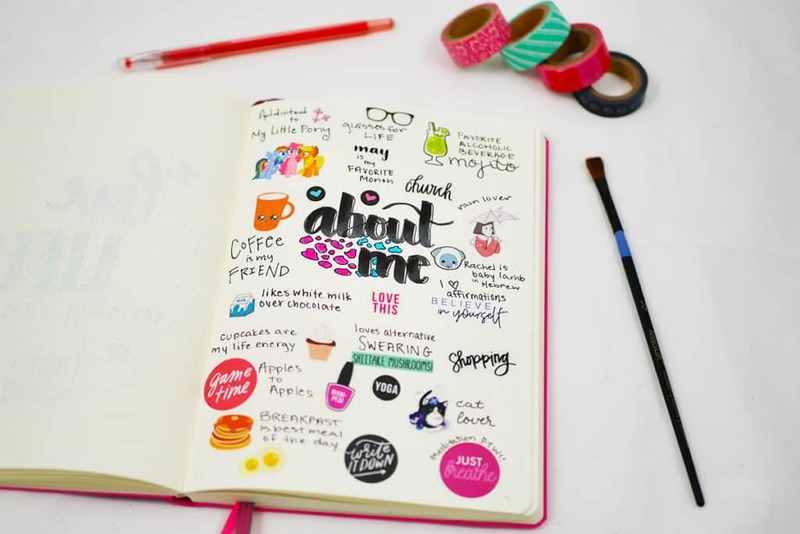 Something worth noting, your About Me bullet journal layout can include everything from doodles, to quotes, to stickers, and whatever else you feel is necessary. If you prefer a minimalist style, you may like doing your About Me bullet journal layout in a list format. If you want to get inventive, your layout can be colorful, full of drawings and other meaningful memorabilia scattered throughout your About Me page. I enjoy getting to see other people’s versions of this brilliant bullet journal spread because you get to see the essence of the individual’s interests and personality. Why is it worth having this spread in your bullet journal? Having an About Me bullet journal layout is creating a physical screenshot of your life as it is at this moment. 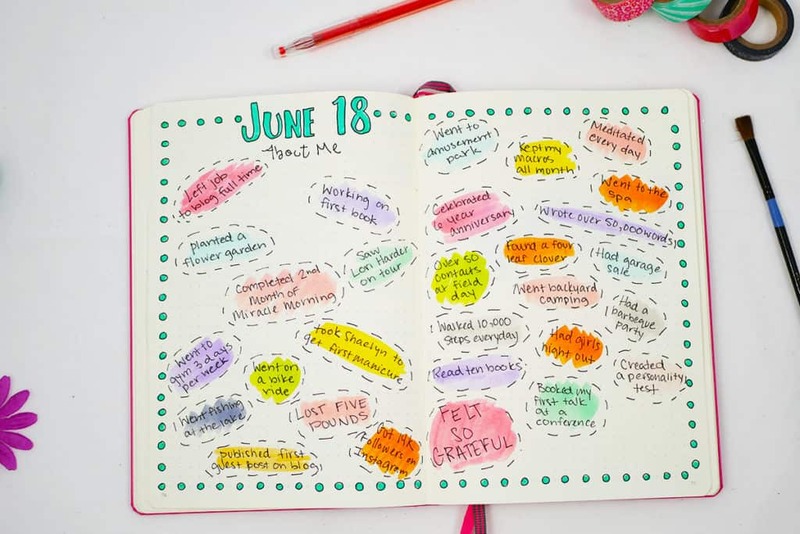 You always have the opportunity to turn back to this epic bullet journal layout to remember what you were like in the past. Think of it like a memories page, but rather than helping you remember specific memories, it helps you remember what you were like as a person. About Me pages in your bullet journal also serve as a terrific mindfulness exercise. It’s so easy to focus on the bad or frustrating situations in your life, consequently forgetting the good or fun going on in your life. More importantly, when you create an About Me bullet journal layout, you’re giving yourself the opportunity to recognize what is currently positive in your life. In the future, you’ll always have these spreads to look back to and remember who you were in the past. It’s amazing how much you can forget in such a short amount of time. So, use your About Me layout to help you remember things you would otherwise forget. 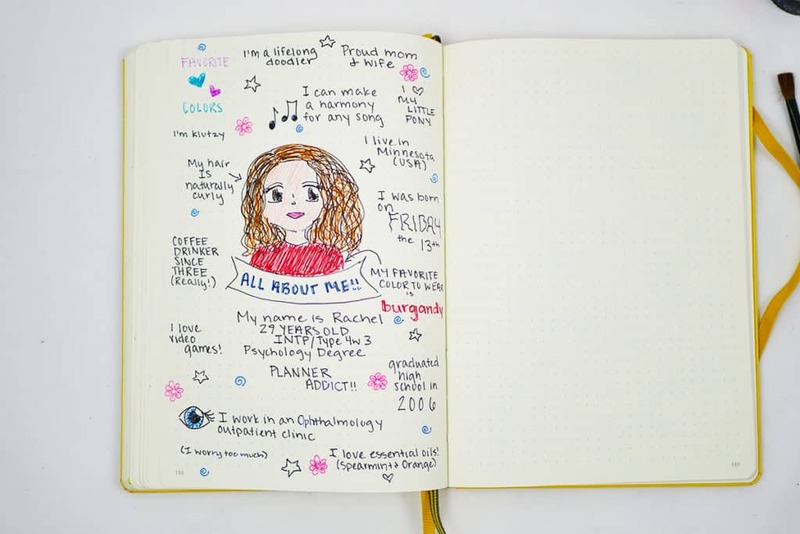 Have you ever created an About Me page in your bullet journal? What have you included in your layout? I’d love to hear about what you’ve created in the comments! This is such a great idea! I’m retired, so I don’t need a-page-a-day (I don’t get THAT much done!) but I still like to keep track of each week’s highlights. This type of layout is perfect for my journal. Cheers! It’s great to hear that this is something that will work for you! I really like this article, Rachel!! I’m definitely going to incorporate this and possibly use it with my clients!